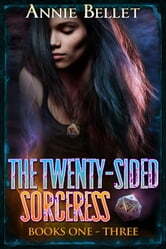 This is the omnibus of the first three books in the bestselling Twenty-Sided Sorceress urban fantasy series by Annie Bellet, collected together for the first time in one convenient volume. Fans of The Dresden Files and The Iron Druid Chronicles will enjoy this series. Until her estranged father shows up begging for help. Someone or something is murdering the crow shifters of Three Feathers ranch and her father believes sorcery is the only way to stop the killings. Faced with an unknown foe, a family that exiled her decades before, a deepening relationship with Alek, and Samir’s ever-present threat, Jade will need all the power she’s gained and then some to stop the Murder of Crows.